On the eve of school starting, I take time to reflect on the summer of 2010. Amidst the excitement of vacations, sailing and preparing for Calvin to leave, I managed to complete a several year project for my neighbor. 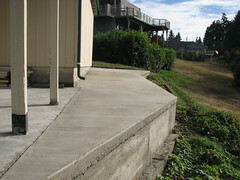 I built retaining walls and poured cement slabs around the remaining portion of his house. The second floor is completely surrounded by decks which I have built, and the bottom floor is surrounded by cement patio or driveway. I'm not sure what's in store for next summer, but he'll think of something! Tomorrow begins a new year in the classroom. I am ready!